In many ways, 2014 hasn’t been the best of years, unless you’re a florist. A dear friend of mine recently went through an unimaginable personal loss, but politely requested that no one send her flowers, because the unintentional metaphor of receiving something beautiful that soon withered and died simply reminded her of what she had lost. 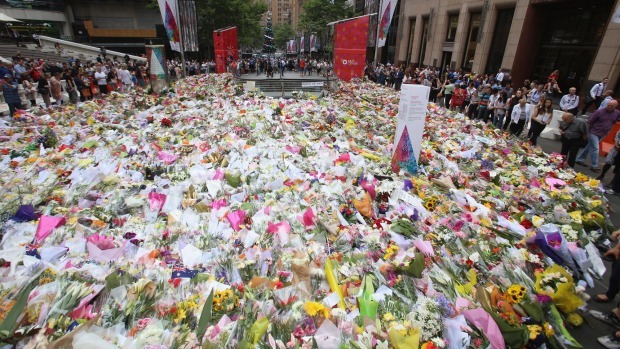 Not that I could have given her flowers anyway – it seems like all of Australia’s bouquets have been laid in Martin Place. The siege in the Lindt Cafe was an assault on Australia’s national psyche as much as it was an attack on a small café in the CBD of Sydney, and marks a highpoint of suffering in the midst of several tragedies back to back. Soon after the tragic events in Martin Place, news came of the murder of eight children from the one family in Cairns. Two weeks before, we were rocked by the sudden death of cricketer, Phil Hughes. Like many, many others in the last few weeks, I’ve felt that discombobulating mix of sadness, compassion, anxiety, and numbness (and many other feelings) that accompanies loss. I was grieving. Grief is not fun. There are a wide variety of ways in which people grieve, of course, though grief is rarely described as joyous. Rather than being the five stages of grief that used to be dutifully learned by every medical and psychology student, grief is now considered a mish-mash of nearly every different emotion that a human can experience, for different lengths of time, at different intensities, in different patterns. Like your fingerprint, your emotional pattern of adapting to loss is as individual as you are. I felt helpless at the news from my close friend, shock at the death of Phil Hughes, and anxious when thinking about the Lindt Café. Each tragedy was also accompanied by a deep sadness. As well as being emotionally draining, the process of grieving can have physical effects as well, associated with high levels of pro-inflammatory cytokine release and the changes that are associated with that (O’Connor, Irwin & Wellisch, 2009). Pro-inflammatory cytokines are also released because of physical stress or infection, so grief would physically feel like you have the flu, which is probably why grieving makes you feel physically awful as well as mentally distraught. As awful as these feelings are, they are important to our healing and restoration. Grief functions as a way of helping us adjust to life on the other side of our loss. Like our body has to heal and adapt to physical wounds, grief helps us heal and adapt emotionally. Grief is not a disease, but a normal process that everyone experiences at one point or another. At times of intense sorrow, we can try and ‘help’ those who are grieving by telling them how they should feel, or what they should do, but during times of grief, being too directional is usually not helpful. The blog today is more general in nature because I don’t want to try and push one particular way of grieving over another. There is no right or wrong way to grieve. My Physical Education teacher often used to say, “No pain, no gain.” Actually, it was more barking through his megaphone, trying to make me run faster in my cross-country race. It may seem an odd match, but the principle applies here too. If you are feeling the sadness and loss over the Lindt Café, Phil Hughes, Robin Williams, or any other personal loss you may have experienced, it’s ok to feel the distress. The pain is hard. The feelings are raw, and they are real. But you will get through them, and they will help you to experience the joy in life again. I am coming to terms with each of these different tragedies in my own way. Lets pray that 2015 is a much better year. If you are struggling and don’t know where to go to talk or find assistance, see your GP or psychologist, visit BeyondBlue (http://www.beyondblue.org.au), or the Australian Centre for Grief and Bereavement (http://www.grief.org.au). If you want to donate to the funds or foundations set up in honour of the Sydney siege victims, please go to http://www.beyondblue.org.au/get-involved/make-a-donation or http://thekatrinadawsonfoundation.org. This entry was posted in Biological, Psychological and tagged brain, caroline leaf, cytokines, flowers, grief, neurobiology, personal loss, phil hughes, robin williams, stages of grief, stress, Sydney, sydney siege, toxic thought by cedwardpitt. Bookmark the permalink.